This client is a very busy local business professional that works from home and his job takes him out to clients most of the time. 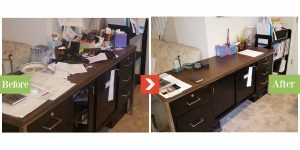 It is not unusual for people who work outside of an office to have difficulty with office organization. He called us because he is getting ready to move. He had plenty of space, but needed a fresh set of eyes to look at everything. We decluttered the entire office, utilized some of the tools he had in place and got his space in order. Another happy client who can function better in his office!